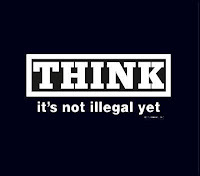 THINK… It’s not illegal yet! 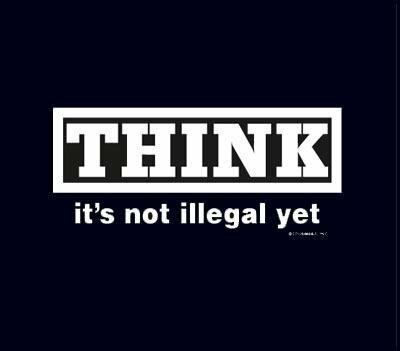 Authority will have you think, what they want you to think – and that everything is OK.
You can trust your Government, Banks, Police and Courts as they are there for you – not themselves. What a rude awakening everyone is in for (especially those of you who are already nodding and about to fall into a deeper sleep). WAKE UP! So what happened? The Credit/Debt Bubble and Bust – that’s what! The Banks were lending money that didn’t exist and now are printing even more to make matters worse. The Government are doing there best to keep the economy going but it has to stop at some point and deflate the bubble. Where does all this money go? Ask your Bank manager and local MP – as someone up the social and economical pecking order is getting it by the truck load. Did you know that even McDonalds got a bail-out loan? Anyone that invested in property is going to be hit hardest, that includes home-owners. Whilst property was booming everyone took their eye off the ball and started speculating. They forgot about the fundamentals, which are to run a business and cash flow (or pay off their home’s mortgage). When the hard times came, many investors have been wiped out and others are having problems dealing with the aftermath of a Boom then Bust (myself included). The true colours of people and businesses will show in these challenging times, so be prepared! Businesses will go bust owing you money, Banks will play dirty and Lawyers will make loads of money with legalese (making the simple complicated). Litigation appears to be on the rise whilst the conveyancing goes down – and bankruptcies up as loan approvals are reserved for the ‘too big to fail’. You have a choice… sink or swim. 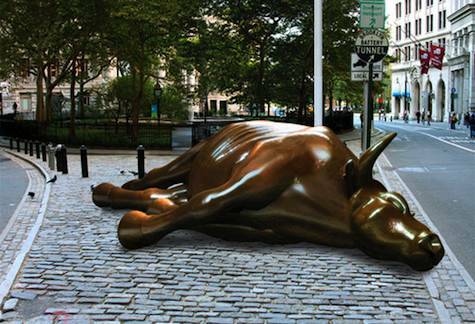 ‘They’ want you to believe the recession is over – but the reality is it’s only just begun. The media is there to keep you dumb and consuming. Some seminars will only share the upside of property investing but shouldn’t you have some info about the downside to get a full picture as well? It’s time to go Back to Basics, Beware of the pitfalls and plan carefully for your future. If you want to swim you need to start thinking differently NOW! Where did the economy go… double-dip here? No bull! There’s a double dip coming unless the Banks lend the Governement a few trillion more! My thoughts on the Economy, now that I have a moment to sit down and flow… here are my answers to some of the questions that people are asking. Below is a bunch of things I wanted to share. If I’m not specific on anything feel free to ask and leave a comment. The Depression, yes that’s what it is economically regardless of the lies the politicians tell you and stats made up by economists, is affecting the majority of people right now. People are losing their jobs, homes and there is no such thing as security. With big companies going bust (those not powerful enough for bailout money) there is no such thing as job security. Employee pensions being gambled away on the stock market and they will be lucky if they have much to live on – that’s probably why they’re pushing the retirement age back. Someone has to pay this back eventually and that means you! Find out about the UK National Debt. You need to be smart in how and where you invest your money right now. Gold has always been a viable option and the demand will always be there for it if you need to sell. Currently Gold has been trading at around £860 / $1380 per ounce and you can always easily get 90% of it’s value from a jeweler or gold dealer. Can you afford Not to invest in Gold? 3. It is also wise to keep some liquid cash on hand, for when you need it. I believe the worst is not yet over. This is the breathing space before the real storm. As people lost their jobs and homes, more mortgage resets are coming, increasing interest rates and fewer jobs. 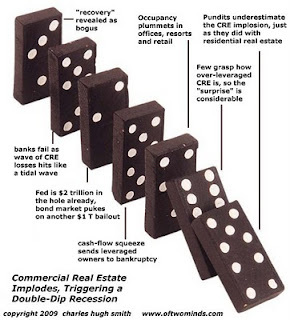 This has worked it’s way through the residential property markets at the moment and the next one to be hit is the Commercial property (real estate) markets. Don’t think it will happen? Walk around your local town centre shops. How many ‘To Let’ signs do you see? More charity shops and pound shops than high street brands? Pubs and bars closing or changing hands more often? Empty shops and cheap stores being the only ones in business are clear signs of the recession/depression. Only another World War could get everyone working again and making money… hmmm… any invasions on the agenda at the moment Mr. Obama? I hope I’m wrong… but what what if this is how it happens? I discussed many of these things with my friend Gerry P. and unfortunately the winds and tornadoes started before I actually implemented and acted on any of the facts. Make sure you’re not left behind by being forewarned. Get educated! The Banks and Governments monitor traffic on the internet now to spy on people, I have know of them doing it with BMV property investors and checking their profiles before processing applications. As TRUST is the Bankers’ issue, maybe they want to look in the mirror too!? The world is waking up and the ‘Federal Reserve’ is now a household name, instead of a ‘perceived’ Government body – in reality it is a privately owned bank that masquerades as a Government body. People are against the War and attacks in foreign countries in the name of ‘Oil’. Enough of living in a Police state with everything being filmed and silly little ‘civil laws’ being invented so they can legally steal your money. Have America not convinced enough people to support them in attacking Iran yet, to prevent Nuclear arms development? Hmmm… remember the WMD-Weapons of Mass Destruction in Iraq? Neither do the dead US soldiers and citizens of the country or their families and relatives. But it made a lot of US dollars and gave them control. The fiat currencies are going to go pop and they need wars to keep their pockets lined and economies going. Read up on Buckminster Fuller’s honest writings: Grunch of Giants and Critical Path. The Amero (have you heard about it?) is as real as the European Union and I won’t even start on the One World Government with the US President (and his puppeteers) in charge. Remember this is a game being played by Governments, Banks and Corporation liars (lawyers) – to support their hidden agendas. I’m not sharing anything new – just repeating it so that you may hear the truth THIS TIME! And if you don’t want to believe it then that’s cool too… just remember the choices you made when you’re waiting for your pension to arrive. I don’t know all the answers but I do know the difference between RIGHT and wrong. Interestingly HONEST is a Powerful (positive) pattern -v- Legal which is a weak (negative) pattern. Despite the doom and gloom – this is a great opportunity for change! Take stock and learn from your mistakes. Accept the feedback. Let the stresses and challenges be your friend and make you stronger. Make plans and do things better this time. The information is already out there and you just need to want to look for it. It requires change from YOU and people to come together and say enough is enough to this slavery. Now is a time that people will remember what really is of value, taking them away from greed and materialism and forcing them to appreciate the other things in life. Remember: don’t be a victim! You’re going to have to let go of the old attachments first. Then get back in charge, take control and be responsible for the life you live! P.S. 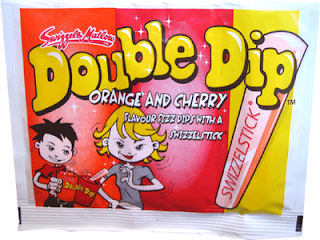 Double Dips are for caring and sharing together!